Dr. Chioma Anah holds a Doctorate of Education (EdD) in Counseling Psychology, is a Registered Art Therapist (ATR), National Certified Counselor (NCC), Licensed Clinical Professional Counselor (LCPC- Maryland), Approved Clinical Supervisor (ACS), a State of Maryland Board Approved Supervisor, and Founder and CEO of PerceptA Therapeutic & Training Center, LLC in Baltimore, Maryland. She has over 15 years experience in the clinical field working with adults and adolescents, working with racially/ethnically diverse populations and facilitating workshops. Dr. Anah is also a founding member and the first President of Maryland Counselors for Social Justice (MCSJ)– 2018-2019. Clinical Supervision: Need a Maryland Board Approved LCPC Supervisor? Dr. Anah is available for clinical supervision for all those seeking counseling requirements for LCPC and NCC, as well as those seeking supervision for their own private work/private practice. Training/Presentations/Keynotes: Dr. Anah also provides training and culturally relevant professional development workshops, keynotes, and consulting services to organizations seeking to improve their skills in effectively engaging with people of diverse cultures. 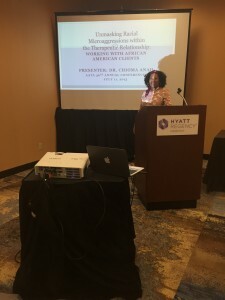 Dr. Anah also provides training on a variety of professional topics including multicultural issues in counseling, racial microaggressions in counseling and the workplace, clinical supervision, mental health issues, and anger management. Dr. Anah has presented in many juried/peer reviewed local, state, and national professional conferences about her scholarly works. Her most recent presentations (2015-2019) have included topics of racial & social activism; racial microaggressions, particularly as it relates to cross-racial counseling dynamics; and art and creativity as tools for healing. 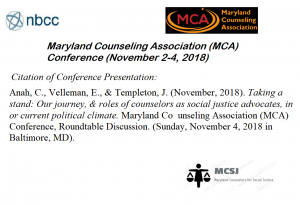 Maryland Counseling Association (MCA) Conference (November 2-4, 2018). 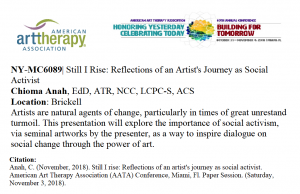 49th Annual AATA Conference- 2018: Dr. Chioma Anah Presenting on Art & Social Activism (November 3, 2018). 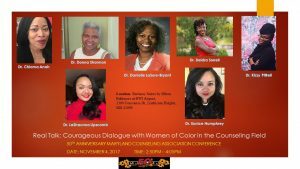 2017 MCA Conference, “Real Talk: Courageous Dialogue with Women of Color in the Professional Counseling Field” (November 4, 2017). Presenters: Dr. Chioma Anah, Dr. Donna Shannon, Dr. Danielle LaSure-Bryant, Dr. Deidra Sorrell, Dr. Kizzy Pittrell, Dr. LaShaunna Lipscomb, & Dr. Eunice Humphrey. 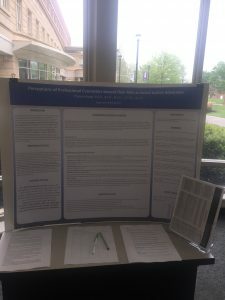 2017 MAMCD Conference Poster Presentation by Dr. Chioma Anah: Perceptions of Professional Counselors toward their Role as Social Justice Advocates. Research Interests and Artwork: Dr. Anah’s research interests includes; multicultural issues in counseling and art therapy, racial microaggressions, social justice & advocacy in counseling, the psychology of racism, and art and creativity as tools for healing. Dr. Anah’s recent artwork (2010-2019) is reflective of her research interests. She wants her artwork to help others increase their awareness of racism in America, and confront long histories of stereotypes and systematic cultural biases. 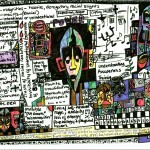 Intersectionality, Art Therapy, & Social Justice: Interview of Dr. Chioma Anah by CSJ Member, Molly Watkins. In Counselors for Social Justice (CSJ) August 2018 Newsletter p. 3-6. Anah, C. (2015). What are racial microaggressions? 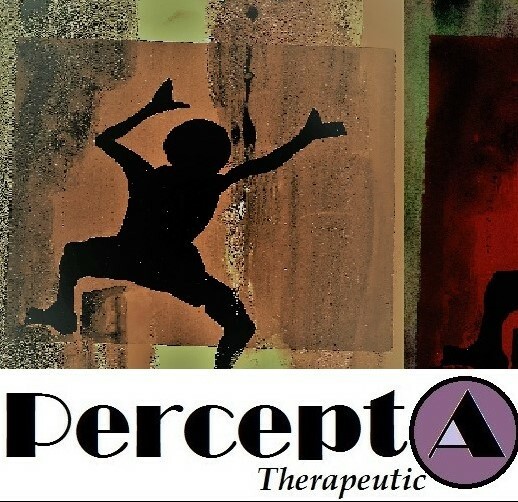 PerceptA Therapeutic Blog, March 2, 2015. 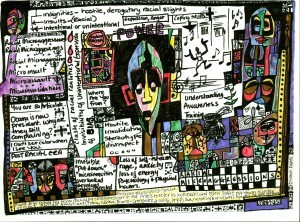 Dr. Anah’s Artwork: Confronts long histories of racial trauma, stereotypes, systematic cultural biases, and racial microaggressions. It also explores the consequences of racism, as well as resiliency and thriving in the midst of racism. Dissertation support/consultation-providing support for graduate students in need of members for their dissertation committee. Culturally relevant workshops to organizations seeking to improve their skills in effectively working with people from diverse backgrounds.